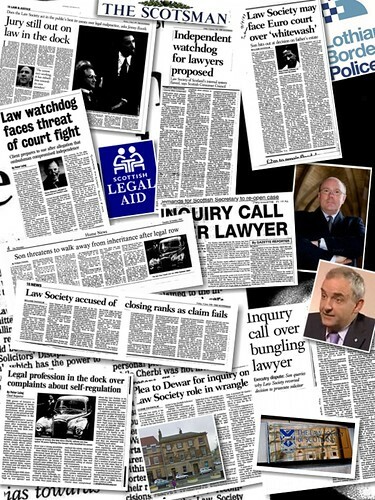 Law Society says lawyers should investigate themselves. A PROPOSAL before the Scottish Parliament calling for views on scrapping self regulation of the legal profession in Scotland - has heard claims lawyers have successfully investigated themselves for seventy years - and that this 'arrangement' should continue. Members of the Scottish Parliament’s Public Petitions Committee have now received the views of the Law Society of Scotland , and Scottish Solicitors Discipline Tribunal (SSDT) - who both want to continue the current system where lawyers maintain their own ‘standards’, write their own rules, and investigate complaints against themselves. However, thousands of complaints a year made against solicitors in Scotland by clients who end up considerably worse off financially after bruising encounters with lawyers even on the most common legal services show the profession’s self regulation model as predominantly dishonest. 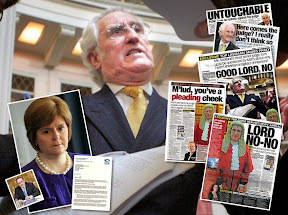 The Scottish Solicitors Discipline Tribunal – who were exposed in a BBC Scotland documentary for shying away from striking off serially dishonest solicitors – ‘suggested’ in their own letter to MSPs - PE1660 A and PE1661: Scottish Solicitors Discipline Tribunal - that the Scottish Parliament wait until a two year review is complete before considering the petitions. The Disciplinary Tribunal said in it's letter to the Committee: "The Tribunal considers that the issues raised in Petitions PE1660 and PE1661 are being considered in the current Review which includes an examination of the legal complaints system in Scotland and an analysis of legal complaint handling in other jurisdictions. Perhaps it would be appropriate to await the recommendations of the current Review before there is detailed consideration of the issues raised in these Petitions". 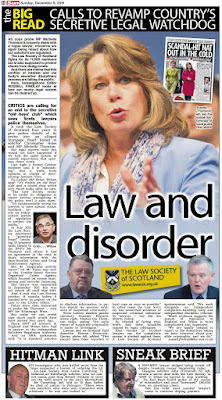 However, the Scottish Government review referred to by the Disciplinary Tribunal - has already come in for stinging criticism due to it’s dominant complement of vested interests from the legal profession who lobby against any change to the current system of regulation where lawyers investigating themselves. The letters come in response to petitions being considered by the Public Petitions Committee calling for a radical overhaul of the way complaints against the legal profession are handled in-house by the Law Society and ‘independent’ Scottish Legal Complaints Commission (SLCC). In September, MSPs called for views on bringing Scotland into line with the rest of the UK – where a much greater independent level of legal regulation exists compared to the current Law Society of Scotland & SLCC pro-lawyer regulation model. Petition 1660 calls on the Scottish Parliament to urge the Scottish Government to review the operation of the Scottish Legal Complaints Commission with a view to making the process of legal complaints more transparent and independent. Petition 1661 calls on the Scottish Parliament to urge the Scottish Government to reform and amend the regulation of complaints about the legal profession in Scotland, which is currently delegated to the Scottish Legal Complaints Commission, by creating a new independent regulator of legal services with powers equivalent to the Solicitors Regulation Authority, Legal Ombudsman, Bar Standards Board and Solicitors Disciplinary Tribunal which serve consumers and clients of legal service providers in England and Wales. The move by Holyrood to look at the issue of self regulation of lawyers - comes after the Scottish Government announced a ‘review’ of legal services regulation in Scotland, back in April 2017. However, the Scottish Government ‘review’ – will not report back until the end of 2018 and with non binding recommendations – and has come in for significant criticism after it was found there was only one consumer related interest among the legal related membership. When the review was announced earlier this year, former Cabinet Minister & SNP MSP Alex Neil said the review remit should also include judges. Mr Neil also called for greater fairness in the panel’s membership, to include members from outside the legal establishment. During the last debate on the two petitions, members of the Public Petitions Committee also agreed to write to the Scottish Government, the Scottish Legal Complaints Commission, the Law Society of Scotland, the Faculty of Advocates, Scottish Solicitors' Discipline Tribunal, Citizens Advice Scotland and the Judicial Complaints Reviewer. If proposals within the petitions go ahead, this would bring regulation of legal services in Scotland into line with independent regulation as practiced in England & Wales. Thank you for your letter of 29 September. We are grateful for this opportunity to feed into the Committee’s consideration of petitions PE1660 and PE1661. As the professional body for Scottish solicitors, we share the petitioners’ desire to improve the regulation of legal services. The Scottish legal sector has evolved considerably since the introduction of the Solicitors (Scotland) Act 1980, which is the main legislative framework governing the regulation of legal services. We are clear that reform is needed, both to protect clients’ interests and to ensure the legal sector, which contributes so significantly to the Scottish economy, can be competitive and continue to thrive. We approach these issues with almost 70 years’ experience of delivering robust regulation of the legal profession. As the principal regulator of Scottish solicitors, we take our duty to protect the public interest extremely seriously, a fact demonstrated through the range of activity which we carry out. First and foremost, we set high professional standards which all solicitors must meet, including a robust route to qualification along with practice rules and guidance which is regularly reviewed. Our highly trained financial compliance team inspect around 370 law firms each year to ensure compliance with our strict accounts rules. In 2015/16 and as a result of these inspections, we raised 17 complaints of our own to the Scottish Legal Complaints Commission (SLCC). Additionally we intervene quickly in firms when things go wrong, ensuring clients know who to contact, where their files are and offering the assurances they need. Even when clients choose to no longer pursue an initial complaint against their solicitor, we will raise our own complaint if it is in the public interest and in order to maintain standards. In total we raise around 30 complaints a year against solicitors to the SLCC. 2016 indicated that 90% of those surveyed are satisfied with the services provided by their solicitor and 82% would recommend their solicitor to others. That poll also demonstrated high levels of trust in the legal profession as a whole. The case for change: We recognise that, despite the strong system of regulation in place, further work is needed to improve that system. This is particularly true around the area of complaints handling, where processes need to be simpler and consumer protection stronger. Given the regulatory framework and processes involved are set out within primary legislation, we are afforded little flexibility within the existing system. This is why we proactively approached the Scottish Government in 2015, submitting a detailed paper which set out the case for new legislation to better protect consumers and allow the legal services market to thrive . Our proposals include better regulation of legal firms and individual solicitors to improve standards in addition to a wider regulatory reach over other legal professionals. This is in response to the dramatic changes we are seeing in the Scottish and UK legal services market. New expectations from clients, new business models, the growth of cross border legal firms and increased technology are all serving to reshape that market. Yet most of the legislation covering the operation and regulation of the legal market is approaching 40 years old and did not anticipate the changes we are seeing today. Whilst taking forward reform, we also believe it vital to preserve the elements and principles of the current regulatory framework which work well - the independence of the legal profession; a single professional body; independent discipline body. These must be protected. We were delighted that, in response to our proposals, the Scottish Government established the independent review of the regulation of legal services, now being chaired by Esther Roberton. We believe this offers a real opportunity to develop a consensus on what reforms are required and how they can be effectively delivered. The complaints system: We note the ultimate aim of both petitions is to urge the Scottish Parliament and Scottish Government to review complaints about providers of legal services in Scotland. We share the petitioners’ concerns and frustration in relation to the complex and unwieldy complaints process that currently exists from the existing legislation. The introduction of the Legal Profession and Legal Aid (Scotland) Act 2007 created the Scottish Legal Complaints Commission (SLCC) which opened on 1 October 2008. The SLCC is a complaints handling body which operates independently of the Law Society and Scottish Government. It has important oversight powers in relation to the handling of conduct complaints by the legal professional bodies, including the power of audit in addition to other consumer protection matters. Under the provisions of the 2007 Act, the Law Society retains the responsibility for managing and investigating complaints relating to the conduct of Scottish solicitors. We regularly engage with the SLCC and enjoy a close working relationship of mutual respect and recognition. We discuss shared matters of concern and ideas for improving the complaints process to the benefit of complainants and the legal profession. We are frequently in discussions with the SLCC and other stakeholders with regard to the various challenges which the 2007 Act raises in relation to legal complaints, in particular the complex processes at the gateway / eligibility stage which result in unacceptable delays. We believe the whole system for managing legal complaints needs to be changed to make the processes involved easier and quicker for the consumer. We are currently in discussions with the SLCC regarding an interim solution which could be delivered through secondary legislation. 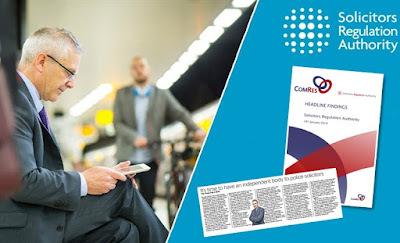 This offers the chance to improve the system by speeding up the eligibility stage of the complaints process until such time as more permanent changes can be made. 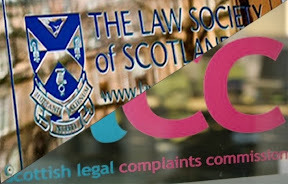 Given that there is no ability for a complainer to make a complaint on the SLCC’s handling of a service complaint, we strongly believe there should also be independent oversight of the SLCC, particularly as the SLCC perform the oversight functions of the Law Society of Scotland and Faculty of Advocates relating to conduct complaints. We note that during the Committee’s meeting of 21 September 2017 a number of members referred to the Law Society’s campaign which resulted in many solicitors contacting their local MSPs to express concerns over the increase in the SLCC’s budget for 2017/18. During this campaign, we raised concerns that the SLCC’s budget could not be formally objected to by Ministers or by Parliament. This emphasises the challenge about the lack of effective independent oversight of the SLCC. I enclose a copy of the standard letter which formed the basis for many of the emails sent to MSPs earlier in the year. We would be happy to provide further background information or meet members of the Committee to further clarify the circumstances that led to the campaign and our position. PE1660: The petitioner argues that the existing appeals route against decisions by the SLCC, via the Court of Session, forms a barrier to those who wish to appeal. We fully agree with this view. We recognise that the concept of pursuing legal action against a public body via the court can be a difficult and daunting process. The requirement to obtain the leave of the Court of Session can put the appeal option out of reach for the majority of complainers, even where they may have fully justified grounds for appealing. This compares starkly to the situation regarding conduct complaints dealt with by the Law Society. Here, if a complainer is not happy with the way we have handled a complaint then they have the option of taking a ‘handling complaint’ to the SLCC. Whilst this does not amount to an appeal, the SLCC can recommend the matter be re-opened for further consideration if due process has not been followed or the decision lacks reasoning. Furthermore, a complainer can appeal a decision directly to the separate and independent Scottish Solicitors’ Discipline Tribunal (SSDT). There is no equivalent process for those complaints dealt with by the SLCC. The only recourse is through seeking leave of the Court of Session. We believe there is a case for reviewing this and hope the work being undertaken by Esther Robertson and her review group will consider this point. The petitioner also states that the Law Society ‘appears to desire no involvement, nor introduce quality control’ in the SLCC’s handling of complaints’. It is important to stress that the current legislative framework provides us no role of oversight of the SLCC, its processes or its decisions. Even where there may be occasions that we disagree with a service complaint decision of the SLCC, there are no special mechanisms which allow us to challenge or raise this other than the general provision which are available to the general public. We also note that comment is made in the background notes on the process by which the SLCC lays reports before Parliament for information only. The provisions of the 2007 Act (Schedule 1 paragraph 16) provide that the SLCC must lay their annual report before Parliament at the end of each financial year. This is in addition to the laying before the Scottish Parliament of the SLCC budget by the end of April each year. These are laid for information only and Parliament has no statutory powers to comment on or amend these in any way. As I have already outlined, we do believe that greater oversight is needed of the SLCC and its performance, a fact which came into stark focus during the budget issues earlier this year. PE1661: Central to this petition is the call for a wholly independent regulator of legal services in Scotland with no ties to the profession. The Law Society of Scotland’s dual role of regulation and professional support has been successfully carried out for almost 70 years. This issue was considered in depth by the Scottish Government ahead of the 2010 Legal Services Act with a clear conclusion that the model of having a single professional body was right for Scotland. At the core of any profession is a commitment to provide the best possible service to the consumer while recognising it has a responsibility to act in the public interest in all that it does. The regulation of the profession is the means by which the profession ensures these aspirations are met. Our dual role is essential in ensuring that Scottish solicitors deliver the highest practical and ethical standards. To ensure we maintain a practical distinction between our two roles, our regulatory function is clearly separated and works independently of our professional support work. That regulatory activity is overseen by the Regulatory Committee in accordance with the provisions of the Legal Services (Scotland) Act 2010. This means it is an independent committee. The Law Society Council is not permitted to unduly interfere with the work of the Regulatory Committee, nor with the work of its sub- committees which are responsible for taking specific regulatory decisions. This is all clearly set out in legislation. To strengthen that independence, the Convener of the Regulatory Committee is chosen by the committee and must be a lay member. Our current convener Carole Ford comes from the teaching profession, bringing both an expertise in standards setting and enforcement but also a clear commitment to the public interest. The committee she chairs has an equal number of solicitor and non-­solicitor members - another element set out in legislation. The concept of a single professional body, with both regulatory and professional support functions, is a model seen in other sectors in Scotland and also in other legal jurisdictions around the world. Here in Scotland, we have the Institute of Chartered Accountants of Scotland (ICAS), the Royal Incorporation of Architects in Scotland (RIAS) and the Royal Institution of Chartered Surveyors (RICS). The teaching profession in Scotland recently moved from separate bodies into the single professional body that is the General Teaching Council. There is clear recognition across a number of professions that having a single professional body is the right approach, particularly given the size of Scotland. Further afield, Law Societies and Bar Associations around the world have dual responsibility for regulation and professional support. These include the Law Society of Ireland, Law Societies in the provinces of Canada and states of Australia as well as bar associations in US states such as California, Florida and Texas. It provides a cost effective, practical, and coordinated professional approach which works in the interests of the consumer. Nevertheless, we recognise the specific areas of concern which the petitioner highlights. The petitioner’s background information notes how the Law Society of Scotland cannot become involved in the decisions of the independent complaints handling body, the SLCC. If there is concern over the accountability of the existing independent complaints body, we do not agree that the way to correct this is to create a new regulatory body. Rather it would be better to create the kind of effective oversight of the SLCC which I have described earlier, the kind of oversight which the Law Society faces from our own Regulatory Committee, the SLCC, the SSDT and the Courts. The background notes also assert that over 600 complaints were dismissed as a result of the court ruling in Anderson Strathern vs. SLCC (CSIH 71XA16/15). As a result of the ruling, which affected around 250 complaints already in the system, the Court of Session has now made a further judgment on the way these cases should be dealt with . We are working with the SLCC to implement the judgment which centres on the way the SLCC have categorised complaints. We have worked constructively and collaboratively with the Parliament and other organisations throughout the passage of the Acts of the Scottish Parliament referred to in the petition background notes. As a professional body which has a statutory duty to protect and further the interests of the public and consumers, we have put forward proposals which demonstrate our commitment to these values. As I have noted, the Scottish Government appointed an independent group to review the provision and regulation of legal services in Scotland, chaired by Esther Roberton. The Committee may wish to consider contacting the review group regarding opportunities for the public, including the petitioners, to present their views on the complaints process for consideration. Thank you again for the opportunity to respond to these petitions. If we can provide any further points of clarification or aid the Committee’s consideration of these petitions further, please contact our Legislative Change Executive. Introduction: The Public Petitions Committee met on 21 September 2017 to discuss petitions PE1660 and PE1661. In short, these conjoined petitions call on Parliament to urge the Government to review and reform the system of legal complaints in Scotland by comparing it to the system in operation in England and Wales. The Committee determined to seek the views of various stakeholders including the Scottish Solicitors ’ Discipline Tribunal. Current system: It may assist the Public Petitions Committee to understand the place of the Tribunal in the system of legal complaints. 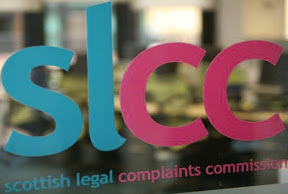 Complaints against solicitors in Scotland are channelled first through the Scottish Legal Complaints Commission (SLCC). The SLCC deals with matters of inadequate professional services itself. It refers conduct matters to the Law Society. The Law Society has powers to deal with unsatisfactory professional conduct itself. The Law Society may appoint a Fiscal to prosecute the most serious cases before the Scottish Solicitors’ Discipline Tribunal as professional misconduct. Individuals cannot make complaints direct to the Tribunal. The Scottish Solicitors’ Discipline Tribunal: The Tribunal is an independent formal judicial body constituted under statute and subject to the appellate jurisdiction of the Court of Session. 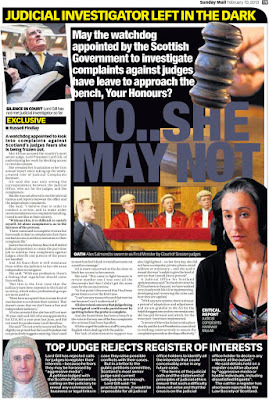 The Tribunal deals with complaints of professional misconduct, complaints that a solicitor has been convicted of an offence involving dishonesty or any other more serious criminal offence, appeals stemming from the Law Society’s determinations regarding unsatisfactory professional conduct, and applications for restoration to the roll of solicitors in Scotland. The Tribunal is made up of 12 solicitor and 12 non-solicitor members. At each hearing the Tribunal comprises two solicitor and two non-solicitor members. Hearings are generally held in public. The sanctions which the Tribunal can impose are censure, fines of up to £10,000, restriction of a solicitor’s practising certificate, suspension, strike off or prohibition on restoration to the roll, and compensation of up to £5,000 for loss, inconvenience or distress if a Secondary Complainer has been directly affected by the misconduct. Every decision of the Tribunal is published in full subject to the terms of paragraph 14A of Schedule 4 to the Solicitors (Scotland) Act 1980. Occasionally publicity is deferred, for example, pending the conclusion of criminal proceedings. The Tribunal’s mission statement is to ensure so far as possible that all cases brought before the Tribunal are dealt with in accordance with the legislative framework and the principles of natural justice, bearing in mind the importance of protecting the public from harm and maintaining public confidence in the legal profession. The Tribunal endeavours to deal with cases efficiently and expeditiously. The Tribunal has a duty to be independent, impartial and transparent. The Tribunal is responsible for the most serious cases of misconduct relating to Scottish Solicitors. Consequently, it deals with far fewer cases than either the Law Society or the SLCC. In the year 1 November 2015 to 31 October 2016, the Tribunal met on 45 days to hear Complaints. 32 new Complaints were received during that year. The Tribunal made 22 findings of professional misconduct and one under section 53(1)(b). The Tribunal made four findings of not guilty and two were remitted to the Law Society to consider as unsatisfactory professional conduct. PE1660 and PE1661: The Tribunal considers that the system of legal complaints in Scotland can be complicated, lengthy and expensive. To a limited extent, the procedure has been simplified following the Court of Session judgements in Anderson Strathern v SLCC  CSIH 71 and Law Society v SLCC  CSIH 36. However, there are still areas for improvement. The Tribunal is currently participating in the Review of Regulation of Legal Services; its Chairman is a member of the Review. The remit of the Review is to make independent recommendations to reform and modernise the framework for the regulation of legal services and complaints handling. The Tribunal hopes that this would modernise and streamline complaints handling. The Review’s remit is to focus on the current regulatory framework and the complaints process. Its aims therefore directly cover Petition PE1660 which calls for a review of the operation of the SLCC with a view to making the process of legal complaints more transparent and independent. . The Review also overlaps Petition PE1661 which calls for reform of the regulation of legal complaints. However, the author of PE1661 calls for this to be done by creating a new independent regulator of legal services with similar powers those held by the SRA, Legal Ombudsman, BSB and SDT in England and Wales. The Tribunal observes that the Scottish Solicitors Discipline Tribunal is the direct counterpart of the SDT in England and Wales. Similarly, the SLCC performs a broadly similar though not identical role to the Legal Ombudsman. The Law Society of Scotland’s Regulation Department performs comparable functions to the SRA. The Faculty of Advocates Disciplinary Tribunal and the Bar Standards Board also have related responsibilities. The role of these bodies in the complaints system is included in the current Review and the Review may make recommendations for changes in this. Therefore, the Tribunal considers that the issues raised in Petitions PE1660 and PE1661 are being considered in the current Review which includes an examination of the legal complaints system in Scotland and an analysis of legal complaint handling in other jurisdictions. Perhaps it would be appropriate to await the recommendations of the current Review before there is detailed consideration of the issues raised in these Petitions. LAWYERS REVIEW THEIR OWN REGULATION: Third attempt by SCottish Government at reforming biased system of solicitors self regulation. The latest review of the way lawyers regulate themselves marks the third attempt at addressing problems created by Scotland’s pro-lawyer system of self regulation, where lawyers write the rules, and look after their own. In 2001, the Scottish Parliament’s Justice 1 Committee, under the Convenership of Christine Grahame MSP, met to consider evidence in relation to calls to reform regulation of the legal profession. 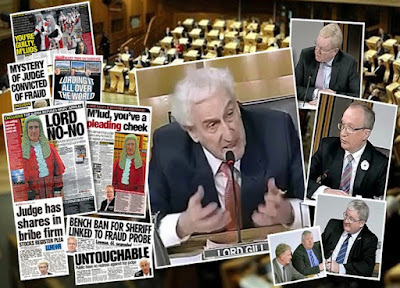 The inquiry, gained by the late, widely respected MSP, Phil Gallie, heard evidence in relation to how complaints were investigated by the legal profession. However, Mr Gallie was replaced by Lord James Douglas Hamilton, and the Committee eventually concluded not to amend how the Law Society regulated Scottish solicitors. 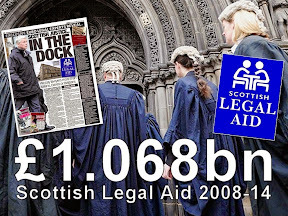 A second, more substantive attempt to reform regulation of the legal profession came about in 2006, with the Scottish Parliament’s then Justice 2 Committee taking on consideration of the proposed Legal Profession & Legal Aid (Scotland) Act, which received Royal Assent in 2007. 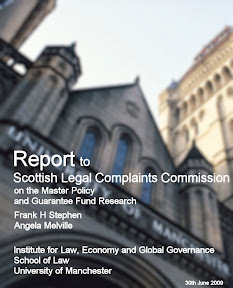 The LPLA Act led to the creation of the now widely derided Scottish Legal Complaints Commission – once touted as an ‘independent’ solution to handing complaints against solicitors and advocates. 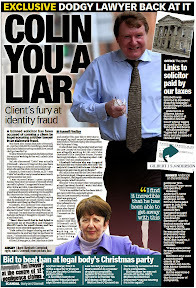 A mere nine years after the creation of the SLCC in 2008, the badly run legal quango, often itself the subject of scandal, charges of incompetence and downright bias – has become as much a threat to consumer protection as the Law Society itself was in the days when complaints were handled at the Law Society’s former HQ in Drumsheugh Gardens, Edinburgh. Tribunals are dominated by wealthy, powerful individuals & professional groups. AMID an ongoing media probe into the undeclared, and significant interests of individuals and professional groups who dominate public tribunals, a call has been made for all tribunal members to declare and register their interests. The manner in which tribunals are created and governed in Scotland, is a familiar model of professionals within the same groups and spheres of influence - awarding jobs to colleagues, the favoured, and vested interests. A no expenses spared approach for tribunal members who tow the line is often the case, enhanced with office accommodation such as the new tribunals centre being created in Glasgow at 3 Atlantic Quay, a high-quality office development close to the River Clyde in the centre of the city. Last week, the Scottish Courts & Tribunals Service (SCTS) confirmed they and Her Majesty’s Courts and Tribunals Service (HMCTS) have decided to rationalise their accommodation and move jointly into the new centre – which is being rented out at nearly £2million a year from the Moorfield Group and partners Resonance Capital. The moves planned to start next year will also mean that accommodation is ready for the tribunals that are going to be devolved to the SCTS. Members of tribunals are recruited by the Judicial Appointments Board (JAB) during appointments rounds regularly held to fill vacancies in the murky world of the Scottish Courts and Tribunals Service and Judiciary of Scotland. Applicants face interviews from their peers across the legal, professional, charitable and public service world & industries awash with public cash, junkets, charity interests, coaching, arbitration & consultancy profits. Successful candidates are subsequently appointed by Scottish Ministers. An example of a recent appointments round run by the Judicial Appointments Board saw 30 new Legal Members and 19 Ordinary Members appointed by the Scottish Ministers to the First-tier Tribunal for Scotland and assigned to the Housing and Property Chamber by the President of Scottish Tribunals, Lady Smith. Legal Members: Yvonne McKenna; Lesley-Anne Mulholland; Nairn Young; Shirley Evans; Alastair Houston; Steven Quither; Petra Hennig McFatridge; Colin Dunipace; Lesley Johnston; Anne Mathie; Kay Springham; Alan Strain; Aidan O’Neill; Jan Todd; Alison Kelly; Valerie Bremner; Eleanor Mannion; Virgil Crawford; Pamela Woodman; Lynsey MacDonald; Karen Kirk; Neil Kinnear; Fiona Watson; Nicola Irvine; Graham Dunlop; Andrew Upton; Joel Conn; Melanie Barbour; Lesley Ward; Andrew McLaughlin. Ordinary Members: Eileen Shand; Elizabeth Williams; Janine Green; Jennifer Moore; Linda Reid; Angus Lamont; David Fotheringham; David MacIver; David Wilson; Gerard Darroch; Gordon Laurie; James Battye; Leslie Forrest; Tony Cain; Elizabeth Currie; Frances Wood; Jane Heppenstall; Melanie Booth; Sandra Brydon. Not one of these members - the thirty lawyers – or the nineteen ‘ordinary’ members - has declared any interests in a publicly available register of interests – as there is currently no requirement to do so. 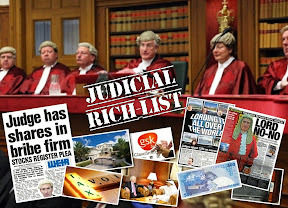 However, the JAB register of interests leaves out any mention of property wealth and many other interests known to be held by those serving on the quango tasked with recruiting Scotland’s judiciary and tribunal members. The world of Disability Living Allowance appeals and PIP appeals has too come under the spotlight - after a study of appeal panels revealed members wealth and property totalling in the millions compared to disabled applicants who were being ‘knocked back’ on applications for a few extra pounds a month. The tribunal structure which covers benefits appeals are riven with huge, wealthy interests, yet there is no register and no ability for those appearing before them to inspect those who sit in judgement upon their claims. In one look at a DWP Tribunal comprising a surgeon, a lawyer and a 'disabled' tribunal member - accumulated wealth between the three, their partners and businesses and properties totalled well into the millions, yet claimants, some with no limbs who are struggling to claim an extra £30 a month and get knocked back while tribunal members are paid expenses & remuneration know nothing of it. A surgeon tribunal member - of 25 years experience as a medical practitioner owned several properties, has several positions on public bodies, has a long history of advising Government departments on medical legislation, has appeared as an expert witness on many occasions for NHS trusts and assisted Medical Defence Unions in the UK against hospital negligence claims. His partner has a similar level of interests in terms of wealth and property, has a wide variety of positions in advising and acting for quangos,public bodies, professions, local and central government. A solicitor member of the tribunal, who has over 20 years experience of a solicitor owns numerous properties, holds several other positions on tribunals and has made a lucrative career of advising and representing quangos, public bodies and has fought and won cases for professional groups. However, the third member – the disability member of the tribunal – proved to be the most interesting. The disability member, who is in receipt of DLA – holds significant assets and property well out of the reach of any typical DLA or PIP claimant. This same disability member appears to hold several positions on public bodies and has frequently travelled on publicly funded junkets. And, the same disability member has been the author of written reports on individuals – one which was described by a former local Government employee as “a personal vendetta” against a claimant from the same town in which the tribunal was held. The former benefits adviser also recalled a recorded hearing – in which the same disability member became aggressive during a benefits appeal hearing - and demanded an assisted blind claimant remove their black glasses. The net worth of the three members of this particular DLA tribunal was estimated at around £5.2m – taking into account the tribunal members partners, whose interests often coincided with public bodies, professions, local and central government. It has also been alleged remuneration and expenses for benefits appeal tribunal members include payments for “knocking back applicants”. A former Local Government employee who worked in the benefits section of a council told of how he had been part of a discussion at his former workplace where a senior member of staff claimed DLA tribunal members had on occasion been paid hundreds of pounds more for throwing out DLA applications. Clearly, those before such a tribunal have the right to know who they face, and the interests of those who judge them. 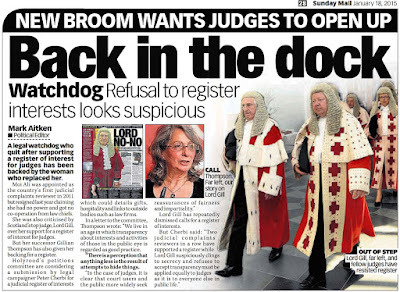 THE man who is leading the transparency campaign for Scotland’s judges to register their interests now says the idea should be extended to everyone who sits on a public tribunal. 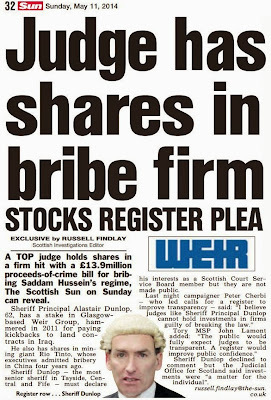 Peter Cherbi will shortly pass the five-year mark in his campaign via the Scottish Parliament’s Petitions Committee for there to be a judicial register of interests, similar to those registers already in existence to which all elected politicians and police officers must conform. The register proposal has been strongly resisted by senior judges and other top lawyers, but is supported by politicians from all parties – the Petitions Committee has taken considerable amounts of evidence and is due to debate the plan again shortly. Now Cherbi, who is well-known in Scottish legal circles for his blogging and campaigning for reform of the Scots law system, says that tribunal members should also have to declare their interests. Under the present system of appointments to tribunals it is up to members themselves to declare an interest if, for example, they have personal relationships with those appearing before them, and step aside from a case – known as recusal. There has been considerable re-organisation of the tribunal system in Scotland since the Tribunals (Scotland) Act 2014 simplified the statutory framework. The First-tier Tribunal is organised into a series of chambers. From December 1, 2016, the Housing and Property Chamber was established and took on the functions of the former Home Owner and Housing Panel and the Private Rented Housing Panel. From April 24 this year, the Tax Chamber was established and took on the functions of the former Tax Tribunals for Scotland. The Upper Tribunal hears appeals from the First-tier Tribunals and the head of the whole system is Scotland’s most senior judge, the Lord President, Lord Carloway, with the Rt Hon Lady Smith as president of the Scottish Tribunals. Others tribunals include the Mental Health Tribunal, the Additional Support Needs Tribunal, the Council Tax Reduction Review Panel and the Lands Tribunal. More tribunals will come with greater devolved powers but employment tribunals are still under the control of the Westminster Government. Cherbi says all such public tribunals should be open and transparent about their members’ interests and points out that there is no register of recusals for any of the tribunals. He said: “As should the judiciary now declare their interests in a publicly available register, members of tribunals who are engaged in the business of judging others should declare their full interests and any instances of recusals in a publicly available register. 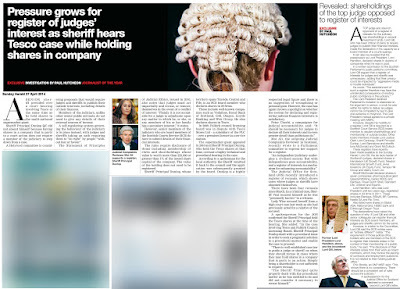 “The business of judging others – for it surely has become a business over the years – must now be subject to the same public expectation of transparency and accountability as tribunals apply to those appearing before them. “The public, the media and our democratically elected politicians in our Parliament, as well as those who are judged, have the right to view, be informed about, and inspect those who judge society with unchallenged power in equal light. 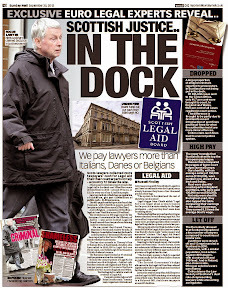 “And this is not just about Scottish Tribunals. Take for instance DLA appeals and PIP appeals. The tribunal structure which covers those are riven with huge, wealthy interests, yet there is no register and no ability for those appearing before them to inspect those who sit in judgement upon their claims. Next year, tribunals will move to an expensive new home in the centre of Glasgow. The Scottish Courts and Tribunals Service (SCTS) and Her Majesty’s Courts and Tribunals Service (HMCTS) are to rationalise accommodation in Glasgow and the new Tribunals Centre will be located at 3 Atlantic Quay. The SCTS claim the 34 hearing rooms for cases to be heard, the design of the centre will provide excellent facilities for all tribunal users, and specific support for young users with additional support needs. Additionally, the centre will provide facilities for vulnerable witnesses to give evidence to both Glasgow Sheriff Court and the High Court. During 2018, the SCTS-supported Housing and Property and Health and Education Tribunal Chambers will move into the new Centre. The HMCTS-operated social security tribunal will move at a similar time with other tribunals HMCTS services to follow at a later date. The SCTS provides support to many of Scotland’s devolved tribunals and is making preparations for the future transfer of the UK reserved tribunals operations in Scotland, currently provided by HMCTS. Calls to include Justices of the Peace in Recusals Register. 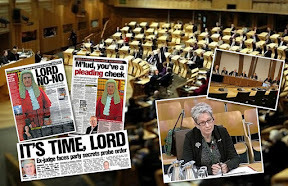 SCOTLAND’S top judge has been called upon to include nearly five hundred members of the Judiciary of Scotland in a Register of Judicial Recusals which was created in response to a five year Scottish Parliament probe on lack of transparency within the judiciary. The Lord President – Lord Carloway (real name Colin Sutherland) - is currently being consulted by the Head of Strategy and Governance of the Judicial Office on collecting recusal data from Justices of the Peace courts. The move comes after journalists queried why JPs were not included in the current register of recusals listing when judges stand down from a case due to conflicts of interest. 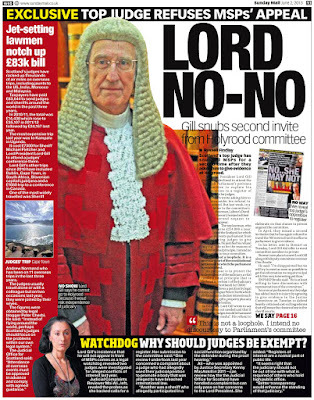 However, amid an ongoing probe on Justices of the Peace – where it has now been established some JPs have undeclared criminal convictions - there has been no explanation provided by the Judicial Office as to why some five hundred Justices of the Peace who comprise the bulk of membership of the Judiciary of Scotland - were left out of the publication of recusals by Lord Gill during the register’s creation in April 2014. 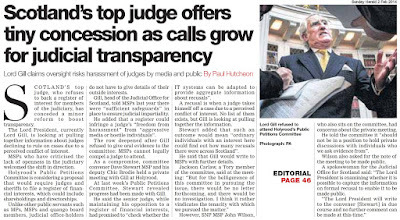 Moves by Scotland’s judiciary to become more transparent and open up the workings of Scotland’s courts and judiciary to the public, have come in response to MSPs consideration of judicial transparency proposals contained in Petition PE1458: Register of Interests for members of Scotland's judiciary. The petition, first debated at the Scottish Parliament’s Public Petitions Committee in January 2013 – calls for the creation of a publicly available register of judicial interests. The creation of such a register would ensure full transparency for the most powerful people in the justice system – the judiciary. The resulting publicly available register of judicial interests would contain information on judges’ backgrounds, figures relating to personal wealth, undeclared earnings, business & family connections inside & outside of the legal profession, membership of organisations, property and land, offshore investments, hospitality, details on recusals and other information routinely lodged in registers of interest across all walks of public life in the UK and around the world. 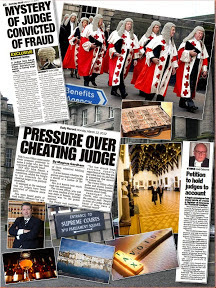 A full listing of evidence in support of the petition calling for a register of judicial interests can be found here: JUDICIAL REGISTER: Evidence lodged by Judicial Investigators, campaigners, judges & journalists in four year Holyrood probe on judges’ interests - points to increased public awareness of judiciary, expectation of transparency in court. 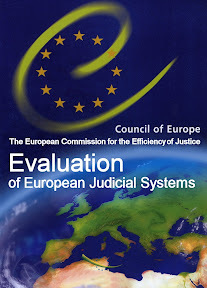 The move to create a register of judicial interests has also secured the support of two Judicial Complaints Reviewers. 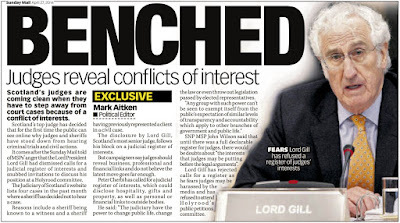 Both of Scotland’s recent top judges - former Lord President Lord Brian Gill, and current Lord President Lord Carloway, have testified before the Scottish Parliament on the petition, both failing to prove any case against creating a register of judicial interests. 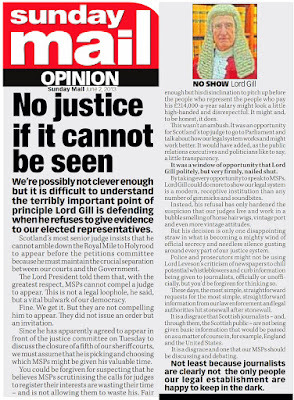 The National newspaper reports on the call to include Justices of the Peace in the Judiciary of Scotland Register of Judicial Recusals. 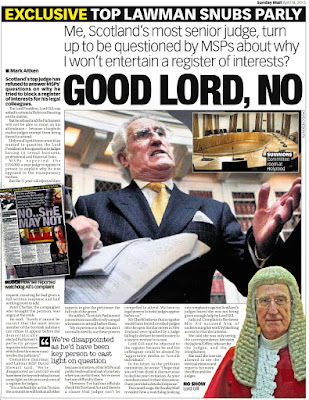 SCOTLAND’S Justices of the Peace should have to register their recusals when they step aside from cases in their courts due to conflicts of interests, according to the man who is leading a campaign on judges’ interests. 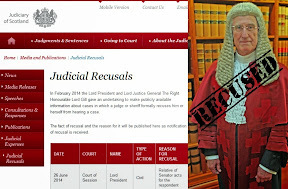 The judicial register of recusals was established by Scotland’s most senior judge in April 2014, former Lord President Lord Gill, and the judiciary website shows all such recusals by judges and sheriffs and the reasons why they stepped away from a case. Now legal campaigner Peter Cherbi has called for the register to be extended to Justices of the Peace, who are lay magistrates dealing with less serious cases such as breach of the peace or minor driving offences. 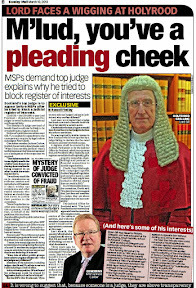 For five years Cherbi has been petitioning the Scottish Parliament on the issue of judges’ interests, and he sees a register of recusals as vital for public confidence in all the judiciary. 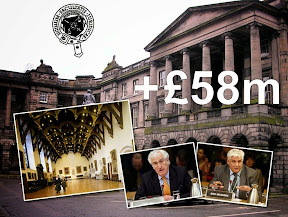 Cherbi said: “Given there are nearly 500 Justices of the Peace in Scotland who must act in accordance with the same rules laid down for other members of the judiciary, JPs should now be included in the Register of Recusals. 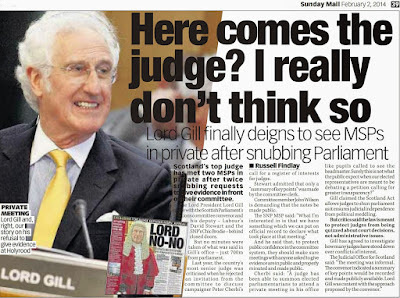 “I am surprised Lord Gill omitted Justices of the Peace when he created the Register of Recusals in April 2014. This was a significant omission, given the numbers of JPs across Scotland, and Lord Gill should have corrected this flaw before he left office in May 2015. 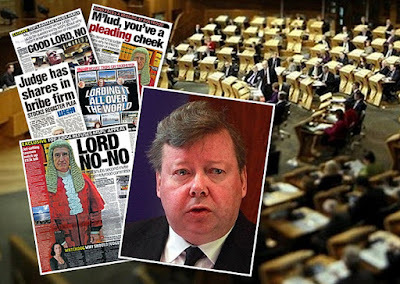 “I note Lord Carloway (left) has not attended to this glaring omission since taking office as Lord President in January 2016 until now being asked to do so. 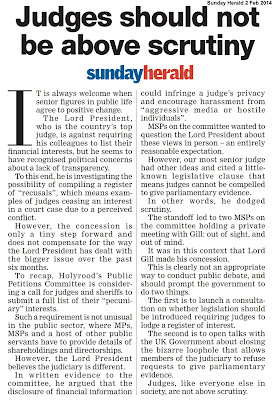 “The omission of Justices of the Peace from the Register of Recusals has left out a significant portion of the judiciary and therefore concealed a more truer representation of numbers of recusals and interests across Scotland’s judges and courts, which are of significant public interest. 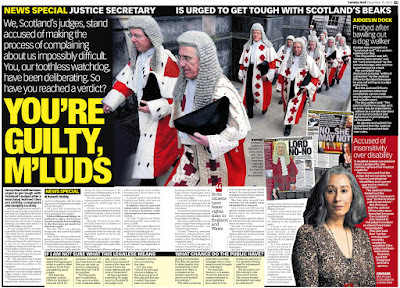 The National contacted the Scottish Justices Association, which represents the Justices of the Peace, but no reply had been received by the time we went to press. 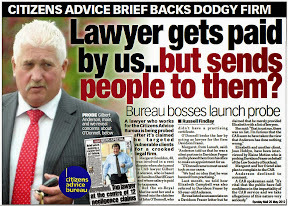 Crown Office paid £10K to law firm subject of Police raid. 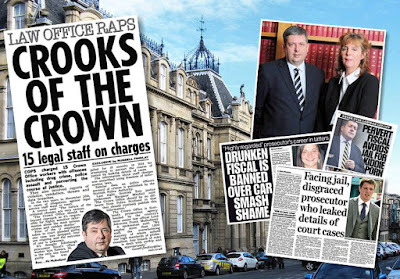 SCOTLAND’S Crown Office & Procurator Fiscal Service (COPFS) has been forced to pay £10K public cash in legal and ‘other fees’ to a law firm representing a ‘important client’ in relation to a botched search blocked by a judge. 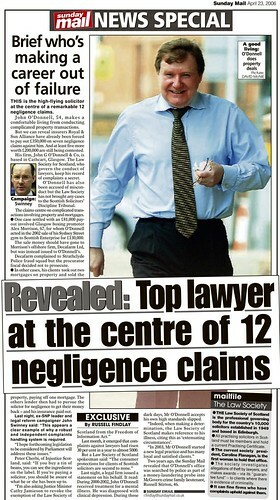 The payment of £10,021.38 to Edinburgh law firm Clyde & Co (formerly Simpson & Marwick) was revealed by prosecutors in response to a Freedom of Information request amid ongoing media enquiries which have now established any possible criminal prosecution in connection with the allegations of abuse is “dead in the water”. The events surrounding the search warrant occurred last summer, in which Police Officers obtained a search warrant to raid the premises of Edinburgh law firm Clyde & Co, in relation to material officers believed the firm held relating to evidence of historical sexual abuse of minors. A search warrant issued by a Sheriff upon an application from the Crown Office to raid the law firm, resulting in two police officers attending the offices of Clyde & Co at 58 Albany Street, Edinburgh, at 10am on 22 July 2016 with a search warrant to obtain the evidence. However, a stand off ensued while Clyde & Co applied to the court for a judge to revoke the search warrant. 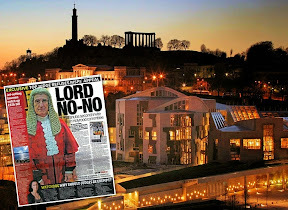 The search warrant was subsequently revoked blocked by senior judge Lord Brodie after counsel for Clyde & Co claimed legal professional privilege was attached to the alleged evidence of abuse. While the Crown Office have now admitted they were required to pay legal & other fees to Clyde & Co, prosecutors refused to divulge any further information on the case, citing the information was held as part of a criminal investigation – which has now been dropped. 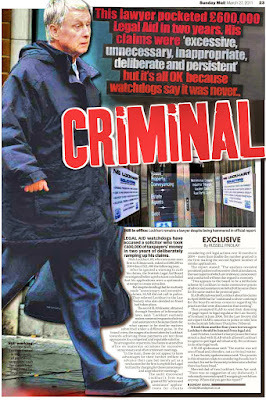 Further enquiries into the case by the media have now established the investigation into the case of alleged abuse has now been dropped – with legal insiders at the Crown Office blaming the Crown Office handling of the search warrant, and the effect of Lord Brodie’s order cancelling the search warrant. 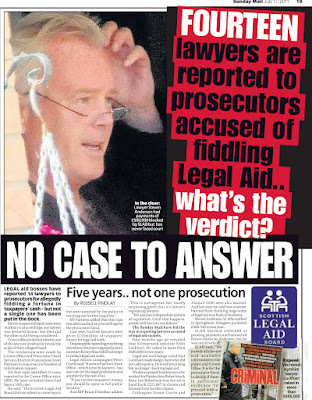 Legal sources have also speculated Police Scotland may have been forced to pay the same law firm – Clyde & Co – for their actions in seeking to serve the warrant and obtain the alleged evidence of abuse. However, faced with further searching enquiries, Police Scotland have point blank refused to disclose any further information about their payments to Clyde & Co and other law firms. 'Standards were not met' when cops turned up with a warrant at Clyde and Co's Edinburgh office and tried to seize 'privileged and confidential' material. Prosecutors have paid £10,000 to a law firm after a botched raid on their offices. Police wanted to seize files from Clyde and Co lawyers that they believed related to an abuse investigation. But the firm objected, stating the material was “privileged and confidential”. Despite this, two officers turned up at the firm’s Edinburgh branch with a search warrant in July last year. The warrant was eventually blocked after a court hearing. Judge Lord Brodie later ruled “standards were not met” regarding prosecutors’ handling of the case. 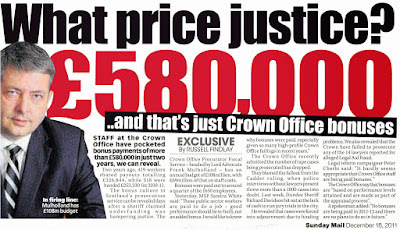 The Crown Office have now paid £10,021 in legal fees and costs to Clyde and Co.
Detective Constable Nicola Gow called Clyde and Co by phone on July 7 last year to tell the firm they had information in their files that might be relevant to a criminal inquiry. Graeme Watson, a partner, told her he would check what information he could provide but that “client files were privileged and confidential”. Gow said she would discuss it with her superior officer but told the firm “a search warrant might be sought”. Watson wrote to the sheriff clerk in Edinburgh stating the files were covered by the “Data Protection Act, confidentiality and agent-client privilege”. Two police officers turned up at the firm’s building in the city’s Albany Street with a warrant at 10am on July 22. Clyde and Co went to court to have it blocked. In his judgment, Lord Brodie found the procurator fiscal’s actions in applying for the warrant “to have been oppressive”. He said the wording was “misleading, if not simply inaccurate” and “requisite standards were not met”. Clyde and Co declined to comment. 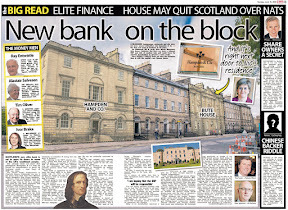 The complainers in this bill of suspension are a limited liability partnership, being solicitors with a place of business at Albany House, 58 Albany Street, Edinburgh. The respondent is the Procurator Fiscal, Edinburgh. The complainers seek suspension of a search warrant granted by the sheriff at Edinburgh on the application of the respondent, dated 21 July 2016 and timed at 1537 hours (“the search warrant”). The application which came before me, on 22 July 2016 not long before 1700 hours in chambers, was for interim suspension of the warrant. As at that time the bill had not been warranted for service. Having heard Mr Smith on behalf of the complainers, I adjourned in order to allow my clerk to advise Crown Office that the application had been presented and to invite the attendance of an advocate depute to represent the respondent. That invitation was made by telephone at a little after 1700 hours. It was not taken up. Having heard Mr Smith further, I suspended the search warrant ad interim, granted warrant for service of the bill and continued the matter to a date to be fixed. The circumstances in which that application was made, as I understood them from what appeared in the bill, in two telephone attendance notes and the explanation provided by Mr Andrew Smith QC, who was accompanied and instructed by Mr Graeme Watson, Solicitor Advocate, a partner in the complainers, are as follows. A client of the complainers is S. The complainers have acted for S in relation to claims for damages against it by individuals on the basis of its vicarious liability for alleged acts which occurred at a particular location, L. These claims have been discontinued on account of an acceptance that any claims were time-barred. It is averred by the complainers that in course of taking instructions from representatives of S these representatives “disclosed certain matters and were provided with advice... which advice and information being disclosed was privileged.” As I understood matters, the complainers retain in their possession documents and files, both paper and digital, generated in the course of acting for S which include information and advice in respect of which S, whose specific instructions have been taken on the point, asserts legal privilege. On 7 July 2016 Detective Constable Nicola Gow contacted the complainers by telephone. She spoke to Mr Watson. There were at least three telephone calls between DC Gow and Mr Watson on that day. I was shown copies of Mr Watson’s telephone attendance notes. DC Gow indicated that she was aware that the complainers held certain information in their client files for S that might be relevant to a criminal inquiry which was currently being undertaken. She already had copies of some documents but wished to obtain originals of these (including what she described as “originals” of unsigned statements held digitally), the litigation files and such other documents which were in the possession of the complainers. Mr Watson advised that the complainers would check what information they had access to with a view to establishing its whereabouts and what might be capable of being produced. Mr Watson indicated that the client files were privileged and confidential. Mr Watson advised that in the event of him receiving instructions to do so, he was willing to excise from the file certain material in order to assist the police inquiry. DC Gow suggested that they might arrange a time to look at the files together. Mr Watson said that he would need to take instructions on that proposal but that a provisional date for such a joint consideration of the files could be arranged. DC Gow indicated that she would discuss matters with her superior officer but that a search warrant might be sought. On 11 July 2016, in anticipation that an application for a warrant might be made, Mr Watson, on behalf of S wrote to the Sheriff Clerk in Edinburgh requesting that the Sheriff Clerk contact the complainers in the event of any application to the sheriff with a view to S being represented at any hearing before the sheriff. Mr Watson explained in that letter that the complainers and S had provided such assistance to Police Scotland as they could within the confines of the Data Protection Act 1998, confidentiality and agent-client privilege. The letter included the sentence: “In our submission it would be oppressive and prejudicial for a warrant to be granted without first hearing from [S].” No reply has been received to that letter. Subsequent to the conversations between Mr Watson and DC Gow and prior to 22 July 2016 neither the police, the respondent nor any other representative of the Crown contacted the complainers in relation to recovery of documents held by the complainers. [S] have indicated that the originals of these documents are held by their legal representatives, Clyde & Co, Albany House, 58 Albany Street, Edinburgh. 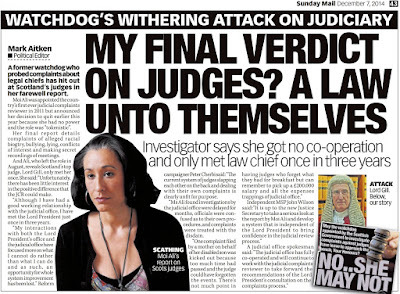 A request has been made to have these documents released to Police Scotland, however, the solicitor has refused to release these documents, citing reasons of client confidentiality. The solicitor has indicated that they will provide the originals of the documents already provided in copy format only. It is also worth noting the Scottish Government have recently announced the scrapping of time bar on historical sexual abuse cases, as the case referred to Lord Brodie does contain references to claims in relation to allegations of abuse becoming time barred. The Limitation (Childhood Abuse) (Scotland) Act 2017 is a piece of legislation which changes the rules around the time limits within which you can make a claim for compensation in the civil courts. Usually you have to make your claim within three years of the injury, or (if it is later) three years from your sixteenth birthday. This change will mean that there will no longer be a time bar on childhood abuse claims in the civil courts. (It applies to abuse of a person under the age of 18.) There will no longer be a requirement to make a claim within the three years or to ask the court to use its discretion to allow the case to go ahead after that period. The law usually prevents claims being taken to court more than once. The Act makes a limited change to this for childhood abuse claims. If you took a claim to court before the Act became law, but lost because of the time bar, the Act means that you should not be prevented from taking another claim to court. This change is in relation to the three year limitation period, which is relevant to abuse that took place on or after 26 September 1964. Ms Ewing said: “Child abuse is the most horrific betrayal of our young people and, even where such crimes were committed decades ago, we will do all we can to help survivors get the justice they deserve. Police Scotland and the Crown continue to work tirelessly to bring perpetrators to justice through our criminal courts. And, while it may not be the right way forward for all, survivors may now be considering the option of accessing justice through the civil courts. Lord Keen of Elie in Singapore. 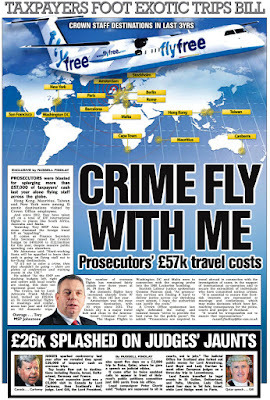 A GOVERNMENT minister with a conviction for a firearms offence is currently in Singapore on a taxpayer funded bash - promoting a UK Legal Services are great campaign in the hope of attracting Asian customers to the UK’s dwindling legal services sector and courts. Lord Keen – real name Richard Sanderson Keen - who joined the Lords on 8 June 2015 and was appointed Advocate General for Scotland – has flown to Singapore to promote the UK legal industry in a social media & twitter #LegalServicesAreGREAT campaign to promote the UK as a hub of legal excellence. However, the same Lord Keen was convicted of a firearms related offence in March 2017. The campaign, hosted at the UK High Commission and other venues in Singapore - brings together lobby groups such as the Law Society of England & Wales, the Law Society of Scotland, a host of legal firms, and so-called ‘independent’ legal regulators – the Legal Ombudsman, Bar Council and others. Attendees to the conference have listened to Lord Keen promoting UK legal services and the so-called world respected UK legal profession & industry. 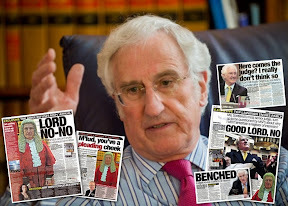 However, in March 2017, Lord Keen – who also once held the post of Dean of the Faculty of Advocates - was fined £1,000 after admitting a firearms offence at Edinburgh Sheriff Court. Earlier this year, Advocate General for Scotland Richard Keen QC pleaded guilty – by letter - to breaching section two of the Firearms Act 1968 by ‘failing to secure a shotgun’. Police investigating a ‘break-in’ at one of Mr Keen’s properties – a house in Edinburgh - found that the weapon had been left outside a secure cabinet. The weapon, a Stephen Grant 12 Gauge shotgun - was outside its required storage area and was in a position to have been made use of, should the need have arisen – observed one firearms expert. 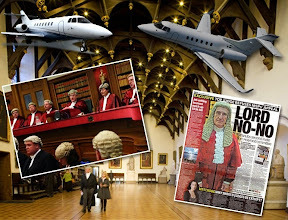 The new Legal Services Are Great campaign, staged by the UK Government and funded by taxpayers cash – in which Lord Keen plays a role - comes amid fears Brexit could turn to Lexit – where legal firms & litigants may chose to conduct arbitration & court business in other jurisdictions. From nearly four decades in the legal profession and as a UK Government minister and Advocate General for Scotland, I have seen first-hand the exceptional talent and expertise within our legal services sector across the whole of the UK. In a global and competitive marketplace, we know what international clients want when they’re looking for legal services. Clients want to choose a law to govern their contracts that gives them the flexibility, confidence and certainty they need. They want legal firms that have a track record in and reputation for providing expert advice. They want judges that are not only experts but also incorruptible and fair when it comes to settling disputes. They want courts that are expeditious and that harness the latest technology. These qualities are all woven into the fabric of the UK’s legal services. Experienced judges: Our judges are renowned for their independence, rigour and commercial expertise in all aspects of the law. As a result, UK court judgments carry a guarantee of excellence which is respected internationally. Professional expertise: The UK’s regulated barristers and solicitors represent clients worldwide. From helping you close cross-border business deals and manage financial transactions to resolving international disputes, our lawyers have the global expertise to help you build your business. Robust contract law: English law is the most popular choice of law for commercial contracts. Valued for its clarity, it’s the world’s most enduring common law system and can provide certainty and security for your business deals. 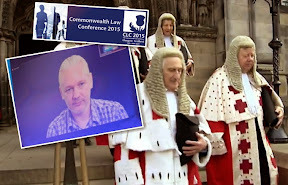 UK: the cradle of the rule of law: The UK is the cradle of the rule of law. The roots of English law are deep; its adoption and influence is wide. It is the product of hundreds of years of evolution — of gradual refinement, development and extension, precedent after precedent. As a result, English common law is clear, predictable and familiar. It underpins over a quarter of the world’s jurisdictions. It is the most popular choice of law in the world for commercial contracts and governs about 40% of all global corporate arbitrations. UK: home to great law firms, expert judges and modern courts: But it is not just the pedigree of English law that makes the UK attractive. Our law firms, our judges and our courts that administer, interpret and arbitrate on the law are world-renowned. Take UK law firms. With four of the top ten law firms in the world and with over 16,000 barristers, the UK has a wealth of talent and top legal expertise and advocacy. Take UK Judges. They are respected internationally for their intellect, independence and commercial expertise, with many having specialist knowledge and practical understanding of commercial matters they are judging. 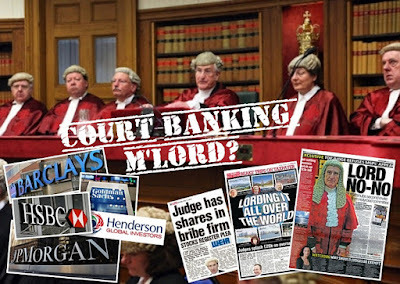 Take the UK’s judicial processes and courts. They do not just have hundreds of years of history behind them, they are among the best in the world in terms of being digitally-enabled. The UK’s legal heritage, together with its expertise and innovation, makes it a popular choice for clients around the world. London brings access to the world’s biggest specialist legal centre for dispute resolution and commercial litigation. 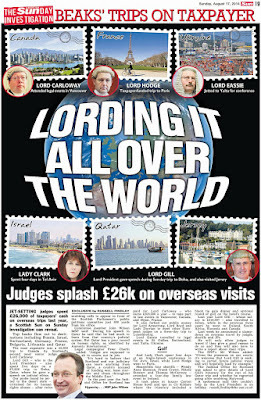 However, the carefully worded claims make no mention of the fact parts of the UK judiciary has been engaged in a five year fight against proposals to require the judiciary to declare their vast wealth, and business interests – which have resulted in countless conflicts of interest in case after case. 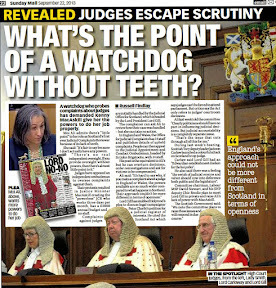 And, more recently it has been uncovered the Ministry of Justice has been concealing statistics on judicial recusals in England & Wales – despite the same information being published in Scotland as paret of the Register of Judicial Recusals - now made available after the work of journalists, Judicial Complaints Reviewer Moi Ali, and members of the Scottish Parliament’s Public Petitions Committee. 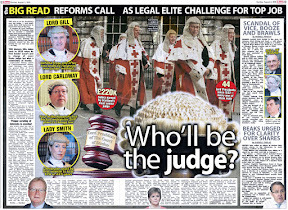 The battle between members of the Judiciary of Scotland and the Scottish Parliament over a petition calling on judges to declare their interests has sparked ire among judges, amid concerns the judiciary are deliberately concealing significant conflicts of interest which has led to injustice across the spectrum of criminal, and civil cases in Scotland’s courts. 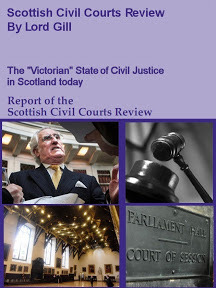 Of further note - all of the claims currently published by the Ministry of Justice in the #LegalServicesAreGREAT campaign - have been challenged by two successive Lord Justice Generals – the ranking top judge in Scotland - where both Lord Presidents Lord Gill, and recently Lord Carloway - branding Scotland’s justice system as stuck in the “Victorian” era, and centuries behind the rest of the world. While keen to promote legal services to the world, the Ministry of Justice could not offer any further comment on the campaign or answer questions on how much public cash was allocated to the project. The Ministry of Justice have refused to confirm claims attendees first, & business class flights & travel to the Singapore conference, hotel stays & hospitality have been paid by taxpayers.